This coming Saturday, May 2nd is set to be a pretty busy day. We’ve got the 2nd Annual Bacon & Beer Classic at Safeco Field (where yours truly will be participating as a judge), the Black Raven Brewing Company (CBM Sponsor) 6th Anniversary ‘Flock Party’, a member work party for Flying Bike Cooperative Brewery members and it’s also National Homebrew Day with a big event taking place at Larry’s Brewing Supply in Kent (and several other locations). Not to mention, the 2nd is also the 141st Kentucky Derby. 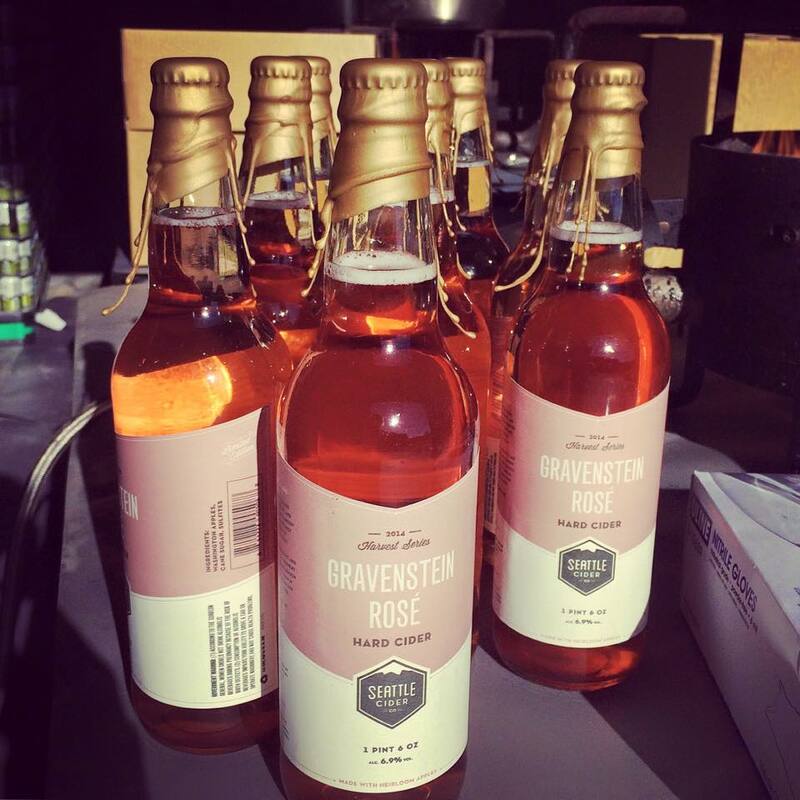 Seattle Cider Company is adding one more event to that list with this Saturday’s release of their new Grevenstein Rosé Cider and Perry – both new additions to their Harvest Series. What began with the introduction of Washington Heirloom last year has now become a limited edition series showcasing some of Washington’s most unique apple and pear varieties. 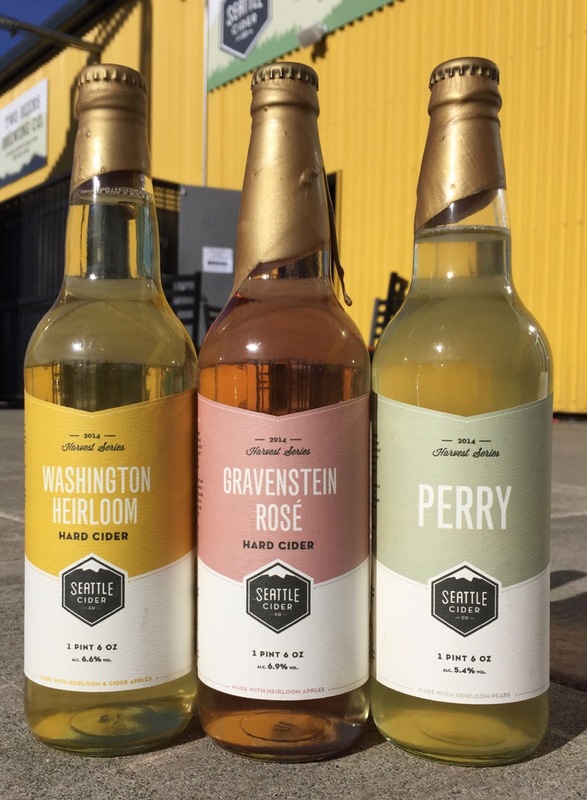 SEATTLE (April 28, 2015) – Seattle Cider Company is excited to announce the release and expansion of its limited edition ‘Harvest Series.’ Introduced last year with the release of the award-winning Washington Heirloom, this year’s Harvest Series will also feature limited releases of the growing cidery’s Gravenstein Rosé and Perry. Handcrafted at the cidery each fall, Seattle Cider Company cidermakers carefully press, ferment, and mature the ciders in the Harvest Series to feature the distinct aromas and flavors of Washington-grown fruit. With a launch party scheduled at The Woods tasting room on May 2, these limited edition ciders will be available on shelves throughout the greater Seattle area beginning May 4. Join the cidermaker and Seattle Cider Company team on Saturday, May 2 at The Woods tasting room (4700 Ohio Ave S) for the official release party of the Harvest Series. Happening from 1-7pm, cider enthusiasts can enjoy tasters, pints and more while picking up their Harvest Series bottles. Also available on tap, enjoy 10-ounce pours of Heirloom & Gravenstein Rosé for $8, and Perry for $6, or taste all three with our Harvest Series Cider Flight, including three taster pours for $10. Additional specialty ciders – including a Bourbon Cyser, Brandy Cyser and Washington Heirloom 2013 – and beer from Two Beers Brewing will also be on tap throughout the day. Naturally gluten free and never from concentrate, all Seattle Cider Company products are made with 100 percent fresh-pressed Washington-grown apples and pears. Find Seattle Cider Company products in stores and on tap throughout Washington, Oregon, Alaska, Idaho, California, Illinois, Texas and Wisconsin, with growing list of locations available at seattlecidercompany.com. For more information, follow Seattle Cider Company on Facebook, Twitter (@seattleciderco) and Instagram (seattleciderco). Not your standard cider. Seattle Cider Company is city’s first cidery since Prohibition, bringing true craft cider back to Seattle and across the country. Bridging the gap between wine and beer with flavorful, small-batch cider, Seattle Cider Company’s year round and seasonal offerings break the mold of overly sweet cider, bringing the natural flavors of Washington apples to the forefront. Naturally gluten free and made from a custom blend of fresh pressed, locally grown apples, Seattle Cider Company’s products are handcrafted with all natural ingredients and never from concentrate, successfully distinguishing themselves from the mass market cider found in stores today. Seattle Cider products are currently available throughout Washington, Oregon, Alaska, Texas, California and Illinois. Visit our tasting room, The Woods, open weekly Tuesday – Sunday at 4700 Ohio Ave. S. in Seattle. For more information, visit seattlecidercompany.com, or follow Seattle Cider Company on Facebook, Twitter and Instagram. Come to The Woods on Saturday and you can try a taste Gravenstein Rosé for $8/10 oz and Perry for $6/10 oz. Better yet, get a flight of both plus Washington Heirloom for just $10. I’m looking forward to trying both of these new ciders myself but, as I noted earlier, I’ll be busy judging at the Bacon & Beer Classic. That’s OK though. If you can’t make it to The Woods this Saturday, don’t worry. As noted above, Gravenstein Rosé and Perry will be available on store shelves starting on Monday, May 4th and, I must say, I love the new, clear bottles. This entry was posted in Cider, Cider Release, Events, Fall, Limited Edition, Seasonals, Seattle, SoDo, Spring, Tasting, Washington Cider and tagged 2015, cider, Cider Release, May, seasonal, seattle, Seattle Cider Company, SoDo. Bookmark the permalink. You bet, Mr. V. Cheers!